If you’ve seen the fireworks over the London Eye, and marched down the Royal Mile at Edinburgh’s Hogmanay, why not celebrate further afield this New Year’s Eve? From champagne-fuelled dinner cruises and fancy galas to street fiestas and record-breaking fireworks, book a break to one of these European party cities and get 2019 off to a flying start. It’s no surprise the clubbing capital of Europe does NYE like a party pro. Berlin’s biggest bash – and one of Europe’s best street parties – takes place at the Brandenburg Gate, with 2km of live music, entertainment and food stalls stretching to the Victory Column. 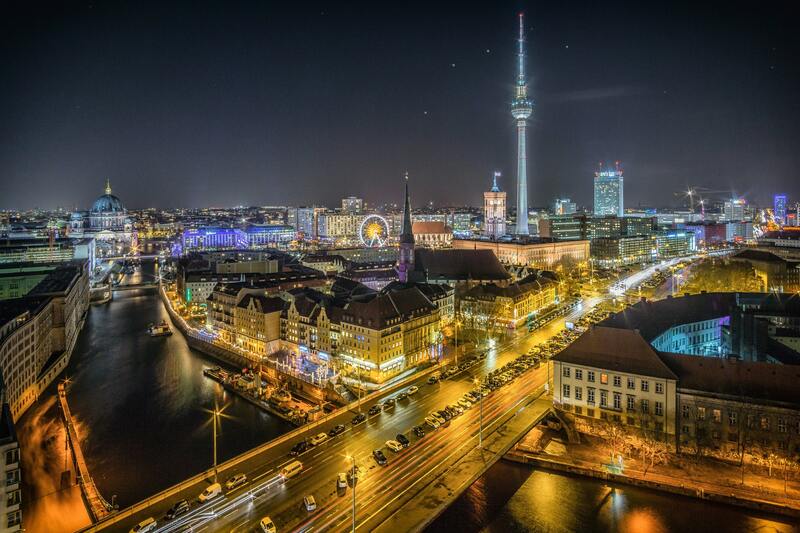 Head to Alexanderplatz at midnight for the fireworks then grab your dancing shoes. Berlin has more clubs than you can shake a bratwurst at, but if you can’t decide where to party the 8-in-1 Ticket is the answer. A pretty fair €93 gets you into eight venues, with the chance to hit 26 dance floors if you’re really going for it. Drinks are thrown in and there’s even a free shuttle bus or ship! The morning after, have a hair of the dog in Markthalle Neun or one of the craft beer breweries before exploring all this historic capital has to offer. Find tons of things to see and do in our city guide. As you might expect in one of the world’s most romantic cities, Venice seals the new year with a kiss. In true Italian style, the annual ‘communal kiss’ sees revellers in Piazza San Marco lock lips with friends and strangers alike in a giant celebration of love and to bring luck (and maybe a new fling) into the new year. Before it gets steamy, a concert in the square kicks off the party and, after the smooching, fireworks are shot directly from a barge in Saint Mark’s basin. 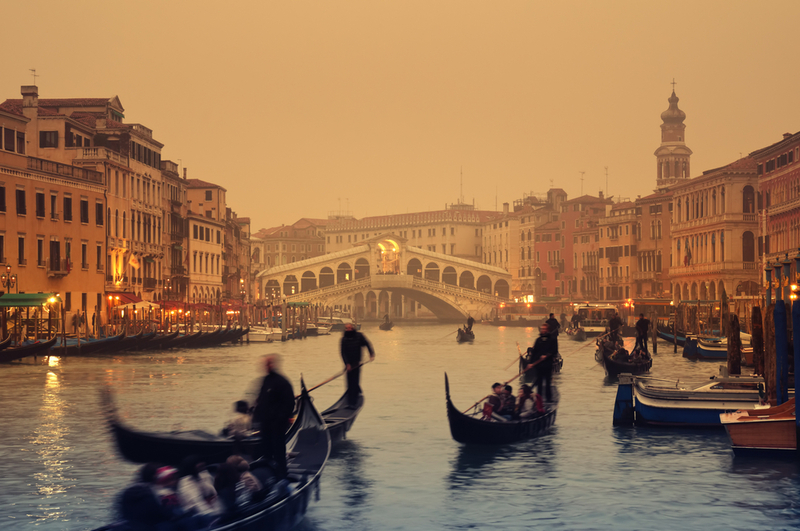 NYE is a great excuse to take to Venice’s famous canals, so why not hop on a dinner cruise and start the celebrations in style. Get in the mood for love by enjoying mouth-watering local dishes by candlelight before mooring up and admiring Venice’s beautiful architecture on the way to the piazza, where you can snog your way into 2019. Prague knows how to party and, with beers costing about $2 a pop, it’s no surprise this buzzy capital is a hit on NYE. Oddly, the official fireworks display is on New Year’s Day but there’s still plenty going on the night before. You can hardly turn a corner without stumbling across lively locals setting off amateur displays (don’t try this at home, kids). 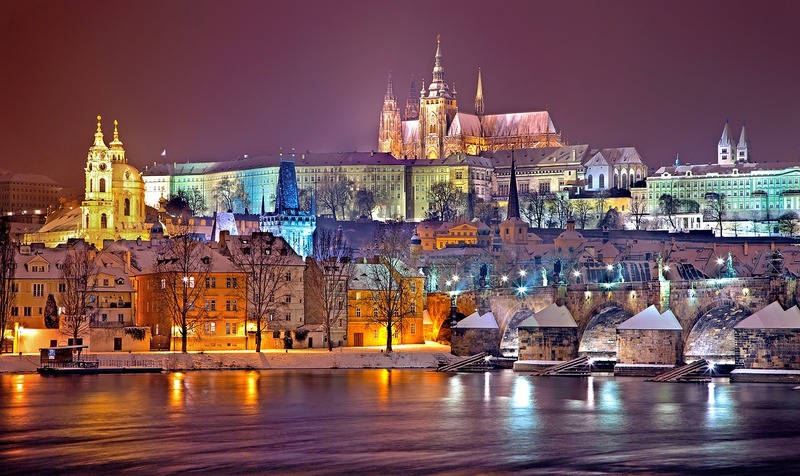 Celebrations centre around Wenceslas, Old Town Square and Charles Bridge, while a cruise along the Danube is a lovely way to admire the pyrotechnics from a safe distance. For something fancy, how about a Mozart Gala Dinner? Taking place across two locations, the Grand Hotel Bohemia’s Boccaccio Hall and Sladkovsky Hall at Municipal House, guests can enjoy six courses while some of the great composer’s finest works are performed, from £295. For more things to see and do in this fairytale city, we’ve got 15 ideas right here. The Spanish capital loves to party, and on the biggest night in the calendar the city streets are jam-packed with locals and visitors ringing in the new year with lashings of cava and tapas galore. 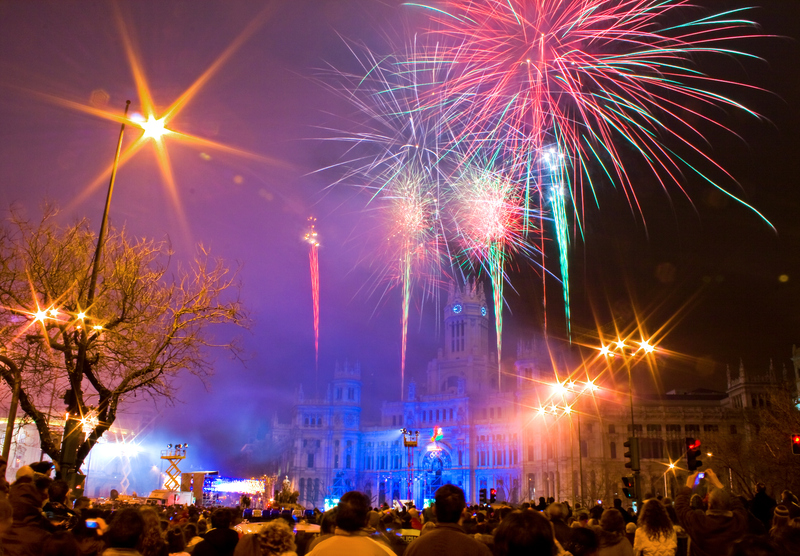 Pack into Puerta del Sol with the revellers to watch the fireworks at midnight, and when the clock strikes 12 make sure you’ve got 12 grapes to hand. This isn’t for a sugar hit before you hit the clubs, it’s a great tradition that no Spaniard dares dismiss. It’s said that each of the 12 grapes will bring you luck for the next 12 months of the year. Wash down your fruity feast (we recommend seedless) with a glass or two of cava then hit up one of Madrid’s clubs – Malasaña is the best neighbourhood for bar hopping until the early hours. 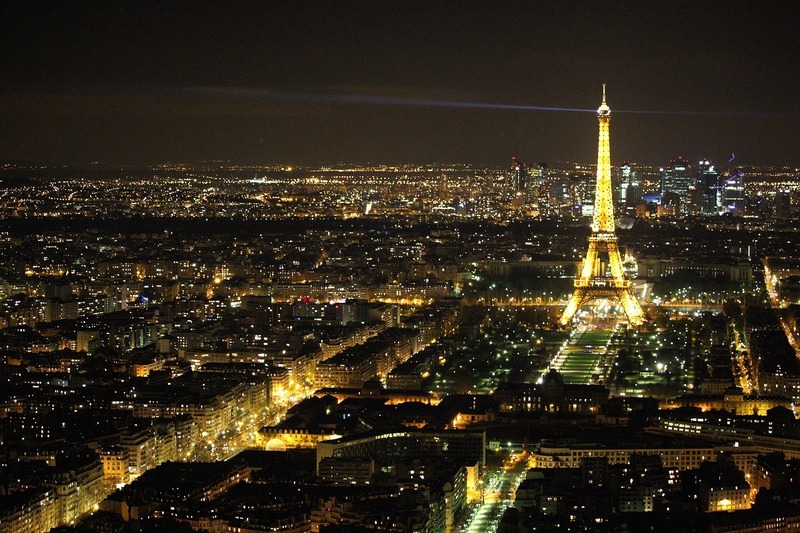 The City of Lights has even more sparkly allure over the holiday season. New Year’s Eve celebrations are suitably sophisticated with a huge choice of dinners and cruises, so you can sip champagne as you float along the Seine admiring the Christmas lights and toasting the new year as the Eiffel Tower comes into view. Paris saves the fireworks for Bastille Day but head to the Champs Elysées for an equally spectacular laser show. Or if you’re in the mood to can-can book one of the legendary cabarets, such as Lido de Paris, which is laying on a six-course dinner before the show on 31 December, from £275. If your euros won’t stretch to that, join the bonkers NYE party opposite the Eiffel Tower at L’Aquarium (from £44), a club that houses – you guessed it – a giant aquarium! Need somewhere to stay? Read our guide to Paris hotels for every budget. 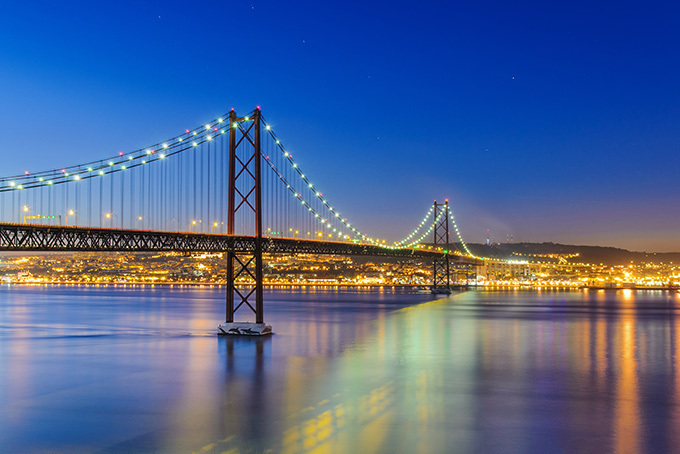 Pretty as a picture Lisbon is a lovely place for a winter mini break and NYE is a great time to get among the city’s vibrant nightlife. Line your stomach at the Time Out Market, where a huge collection of award-winning chefs whip up culinary delights under one roof, then roll into Comercio Square downtown for the free concert at 10pm and fireworks at midnight. If you fancy a boogie, book a ticket (from €25) to the famous Royal Palace Party. This legendary shindig sees DJs hit the decks at the grand Tapada da Ajuda, which has amazing views over the Tagus River. Not your style? Keep it street by heading to the bar-lined alleyways of Bairro Alto where you can whittle the whole night away mingling with new friends over a little too much port. If you’re still going, watch the first sunrise of 2019 – and enjoy gorgeous views of the city to boot ­– from a miradouro (viewpoint). For more Lisbon highlights, read our top 15 attractions. 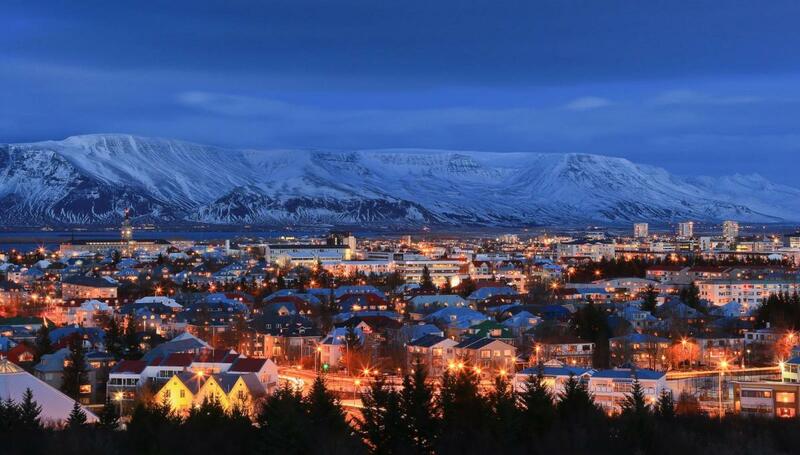 Icelandics go wild for NYE and Reykjavik has an electric atmosphere on the big night. With fireworks shooting up all over the city, head high to get the best views. From Öskjuhlíð hill you can see almost the whole of Reykjavik as the sky is flooded with exploding lights. They love their bonfires in Iceland too, and the city will see several spots go up in flames on 31 December. Visiting them is a great way to plug into the local traditions – and warm up! There are even bonfire tours you can join. Around 10.30pm there’s a break in proceedings when the nation stops to watch the Áramótaskaup, an annual TV comedy show. Then everyone piles back on to the streets for the final showdown. If you’d rather avoid the crowds, ring in 2019 with a glass of bubbles on a fireworks cruise, which depart from the Old Harbour at 11pm. You could continue the adventure by hunting down the Northern Lights – Iceland is one of the best places to see them in Europe. Having shaken off its reputation as the holiday choice for the over-60s, Madeira now attracts a more adventurous traveller seeking exotic thrills – and they’ll find them on the last night of the year. The island is a top choice for NYE thanks to its incredible fireworks display, which holds a Guinness World Record for the largest in the world! Before the main event, The Madeira Classic Orchestra performs a New Year’s concert at the city pier in front of thousands. Then the countdown heralds the dramatic light show spanning the naturally formed amphitheatre of the capital Funchal, which is illuminated by thousands of multi-coloured lamps placed up and down the city’s main avenues. The best way to enjoy the spectacle is undoubtedly from a boat at sea, but the bay itself and the hills around the city make wonderful vantage points, too. For more on Madeira, plus nine other winter sun spots, read our guide. 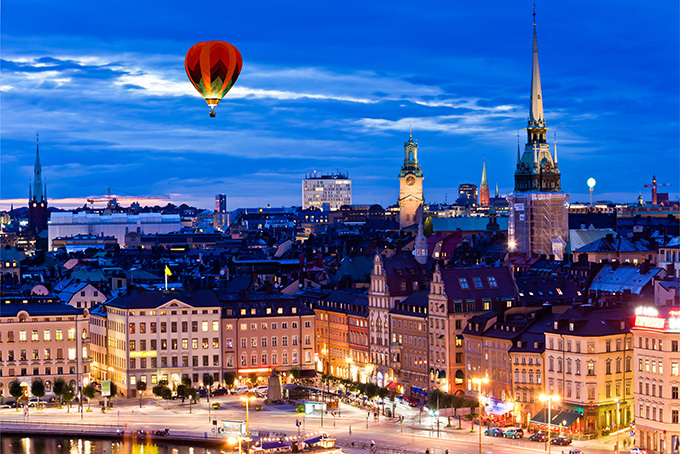 NYE in Stockholm covers all bases with the chance to party like it’s 1999 or indulge in some lagom(the Swedish version of Hygge). Wrap up warm and start the night with a swish or a stumble around the ice rink at Kungstradgarden, which is modelled on the famous rink in New York’s Rockefeller Center. Then head to the open-air museum Skansen for the reading of Alfred Lord Tennyson’s Ring Out Wild Bells. The poem has been read by a famous Swede every year at midnight since 1895 and is a beautifully reflective tradition. Afterwards, ‘ooh’ and ‘ahh’ at the fireworks reflected in the water near Skansen, or admire them from the inner harbour at Stockholm’s old town. If you’re in it for the long haul head to Södermalmstorg, an area brimming with bars and restaurants where residents and visitors gather before heading off to local clubs. 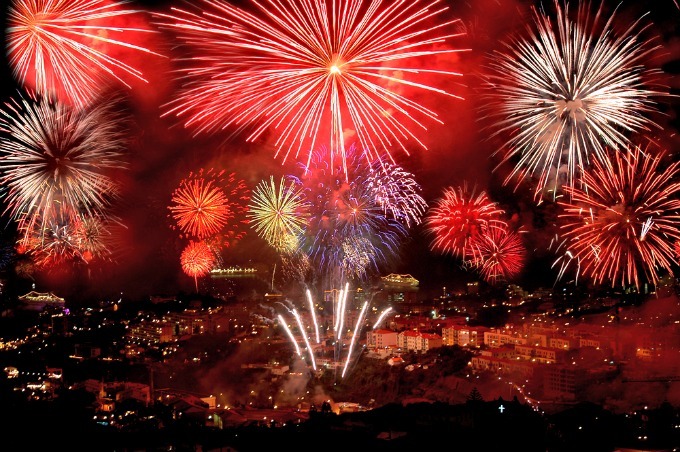 The wild card in our list, Istanbul goes all out on NYE. One of the best ways to spend it is at a restaurant or one of the big hotels, which lay on special menus and cocktail-fuelled parties for the big night. Try to book one with a rooftop bar close to the shores so you don’t have to scarper at midnight to find a firework viewing spot. If you want to keep it civilised, board a New Year Bosphorus dinner cruise and enjoy a delicious Turkish feast to the sounds of traditional folk music and DJs as you cruise past the illuminated Fatih Sultan Mehmet Bridge, Blue Mosque and Dolmabahçe Palace. Or stay on dry land and join the locals in the side streets off Taksim Square, which are packed with intimate bars and pubs. Chairs and tables overflow on to the street, music fills the air and boisterous revellers smoke, chat and dance their way into the new year. 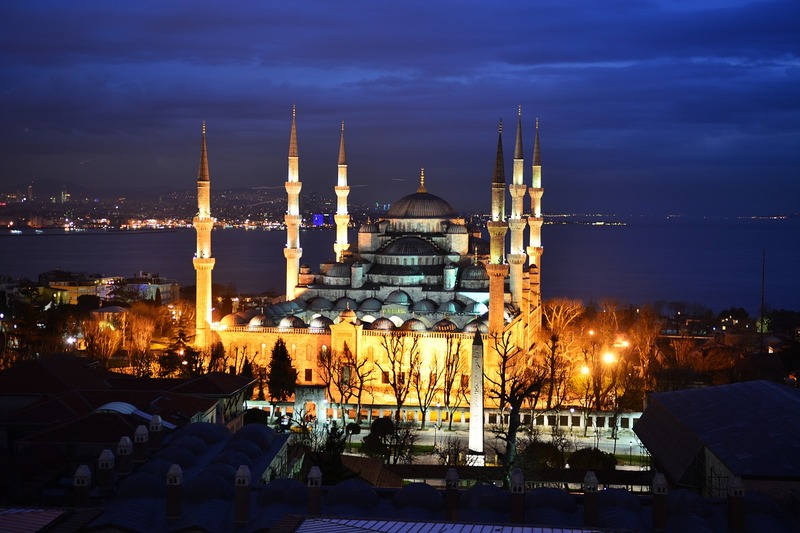 Plan your trip to Instanbul, including ideas for where to stay, with our guide to November holiday hotspots. All flight and prices mentioned in this article are estimates of the cheapest prices based on Skyscanner’s flight search tools. These are subject to change and were correct at time of publication on 6 November 2018.